Apple CEO Tim Cook is defending the eye-popping price tag of its highest-end handset, the iPhone XS Max. The tech giant last week unveiled the latest lineup of its flagship smartphones, the $749 iPhone XR, $999 iPhone XS and the iPhone XS Max, which for the version with the most storage, can cost up to $1,499. 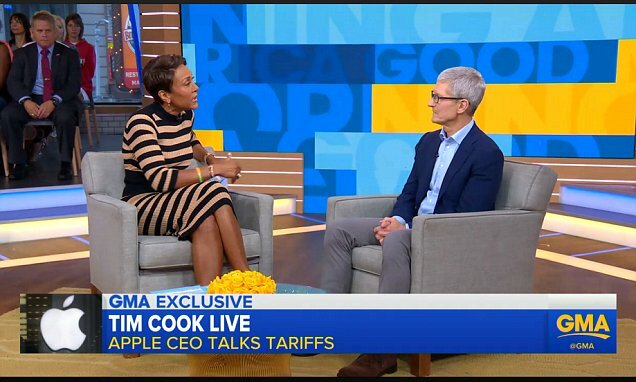 Appearing on ABC's 'Good Morning America' Tuesday, Cook discussed the company's most expensive iPhone yet. 'The phone has replaced your digital camera. You don't have a separate one anymore. It's replaced your video camera. It's replaced your music player. It's replaced all of these different devices,' Cook said. Cook added that carriers offer monthly payment plans that help to reduce the cost of an iPhone on an overall basis. He attempted to justify its high price by citing an example that some owners of the iPhone XS Max can pay about $30 a month for it, bringing the payments down to about $1 per day, Cook said. And Apple ultimately wants to make an 'iPhone for everyone,' he continued.